Clayton efficiently breaks down the enormous task of marketing a business on the Internet. 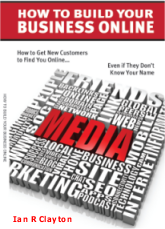 Ian R. Clayton, online marketing expert, has announced the arrival of his new book, "How to Build Your Business Online" - http://BuildYourBusinessOnlineBook.com. Clayton’s new book is a guidebook that takes readers though the perils of local online marketing. Available for sale on Amazon.com Now, this book covers everything that should and should not be done when it comes to marketing any local business online. “Did you know that there are 2.6 billion online searches conducted every month and growing? That 98% of people searching online will choose a company they see on the first page of results, with 70% of all clicks going to the top three spots and it’s easy to see why every local business needs to be online,” said Clayton. The book is designed for business owners and managers who need a quick and useful guide to what the new media and internet marketing are all about. It is not intended for tech-savvy individuals. Many concepts are very leading-edge and will be useful to anyone, including season marketing professionals. For business owners who understand the need for an online strategy and may be thinking of outsourcing the job of developing it, the book gives sound advice on what to do in-house and what and why you may need to outsource others. It is easy to read and spells out what needs to be done in frank and fun style that explain everything you need to know about marketing your business on line and importantly what to expect in the future and how to profit from the new media in the age of participation..
Magazine Editor Nicole Kidder, adds “Backed by nearly 30 years of experience helping small businesses build sustainable brands, Clayton efficiently breaks down the enormous task of marketing a business on the Internet. The thorough outline helps small business owners identify which tools are worth investing in as well as which tasks they can easily tackle and those they should outsource to a professional marketing firm. This book covers all of the major areas of building, marketing and maintaining a business’ Brand online. One of the key strategies is “how to be found in search results” and Clayton reveals Search Engine Optimization (SEO) strategies used by his company to get clients to the first page of Search for important keywords. Also covered are Google map Places, Social Media, Content Marketing (video, articles and blogs) and Mobile. With Mobile expected to be the primary way in which consumers search the Web by the end of 2012, no business marketing strategy can be without a mobile focus. In fact, Clayton says, “Mobile is taking center stage now in online marketing. Its interactive and immediate response makes it the preferred vehicle to follow up on and close business”. Ian has been a Chef, a Hotel General Manager and a Vice President of an International distribution company before starting his own company, AXSES Information Systems, in 1984. He has a BA in Business and completed a year in a Master’s degree (MSc) (Computer Science ABT) at Concordia University, Montreal, Canada. Ian Created SocialIndexEngine in 2011. SIE integrates Leading Marketing Strategies and Systems with AXSES own marketing know-how, and Travel Technology. Ian plans a series of video seminars, a book buyers forum and community which will be build on the book website http://buildyourbusinessonlinebook.com. A new book is already in the works! As CEO of AXSES http://axses.com, Ian and his team have been helping business owners manage business systems. In 1994 the company was a pioneer in building online systems for the Internet. AXSES has been working extensively in the Tourism area, probably the toughest e-commerce market of all, and now brings considerable knowledge and skill to any business.